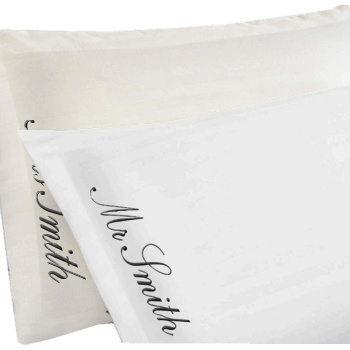 Luxurious embroidered or monogrammed Egyptian Cotton Oxford style pillowcases. Luxurious embroidered or monogrammed Egyptian Cotton Oxford style pillowcases. Superior quality Egyptian cotton percale pillowcases made from all natural cotton with a 200 Thread Count fabric. Your choice of embroidered personalisation, be it Mr and Mrs or His and Hers or maybe each persons name or initials! A stylish original gift for couples, for a wedding or anniversary gift. The personalisation is embroidered in your choice of thread colour and font style. These quality embroidered pillow cases are machine washable and ironable which provides a far better lasting finish than with the printed versions available elsewhere. Please choose from White or Cream coloured pillowcases. The pillowcase measures 50x75cm oxford style with satin embroidered hem on inner edge of 2 inch border. Embroidery is positioned along the opening side of the pillowcase so that this gift can be comfortably slept on making a unique yet useful gift! Please allow approx 24-48 hours for dispatch as these are made to order. Additional Special Request is an option if your name is just a little longer than our standard text box. If you need extra lettering beyond the 12 letter text box area, please email us about this.